New Mexico resists Texas, applies to be free country. 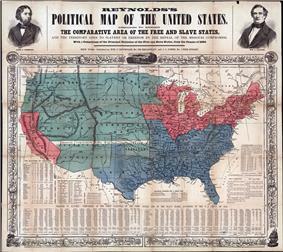 The Compromise of 1850 was a package of five separate bills passed in the United States in September 1850, which defused a four-year confrontation between the slave states of the South and the free states of the North regarding the status of territories acquired during the Mexican-American War (1846–1848). The compromise, drafted by Whig Senator Henry Clay of Kentucky and brokered by Clay and Democratic Senator Stephen Douglas, reduced sectional conflict. Controversy arose over the Fugitive Slave provision. The Compromise was greeted with relief, although each side disliked specific provisions. California's application for admission as a free state with its current boundaries was approved. The South prevented adoption of the Wilmot Proviso that would have outlawed slavery in the new territories and the new New Mexico Territory and Utah Territory could in principle decide in the future to become slave states (popular sovereignty). In practice, these lands were generally unsuited to plantation agriculture and their settlers were uninterested in slavery. Banned the slave trade (but not slavery altogether) in the national capital Washington D.C. The Compromise became possible after the sudden death of President Zachary Taylor, who, although a slaveowner, had favored excluding slavery from the Southwest. Whig leader Henry Clay designed a compromise, which failed to pass in early 1850, due to opposition by both pro-slavery southern Democrats, led by John C. Calhoun, and anti-slavery northern Whigs. Upon Clay's instruction, Democratic Senator Stephen Douglas (Illinois) then divided Clay's bill into several smaller pieces and narrowly won their passage over the opposition of those with stronger views on both sides. An animation showing slave and free states and territories, 1789–1861. Soon after the start of the Mexican War, when the extent of the territories to be acquired was still unclear, the question of whether to allow slavery in those territories polarized the Northern and Southern United States in the most bitter sectional conflict up to this time. Since Texas was a slave state, not only the residents of that any State, but the pro- and anti-slavery camps on a national scale had an interest in the size of the state of Texas. Texas claimed land north of the 36°30' demarcation line for slavery set by the 1820 Missouri Compromise. 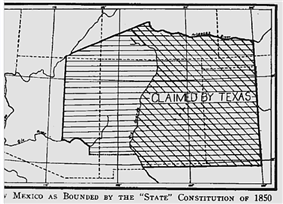 The Texas Annexation resolution had required that if any new states were formed out of Texas’ lands, those north of the Missouri Compromise line would become free states. Senator Joseph Underwood referred to "the threatened civil war, unless we appease the hot bloods of Texas." According to historian Mark Stegmaier, "The Fugitive Slave Act, the abolition of the slave trade in the District of Columbia, the admission of California as a free state, and even the application of the formula of popular sovereignty to the territories were all less important than the least remembered component of the Compromise of 1850--the statute by which Texas relinquished its claims to much of New Mexico in return for federal assumption of the debts." Stegmaier also refers to "the principal Southern demand for a division of California at the line of 35° north latitude" and says that "Southern extremists made clear that a congressionally mandated division of California figured uppermost on their agenda." During the deadlock of four years, the Second Party System broke up, Mormon pioneers settled Utah, the California Gold Rush settled northern California, and New Mexico under a federal military government turned back Texas's attempt to assert control over territory Texas claimed as far west as the Rio Grande. The eventual Compromise of 1850 preserved the Union, but only for another decade. The Wilmot Proviso banning slavery in any new territory to be acquired from Mexico, not including Texas, which had been annexed the previous year. Passed by the House in August 1846 and February 1847 but not the Senate. 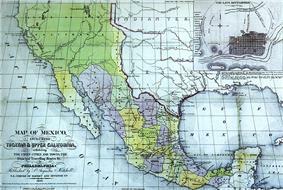 Later an effort failed to attach the proviso to the Treaty of Guadalupe Hidalgo. Failed amendments to the Wilmot Proviso by William W. Wick and then Stephen Douglas extending the Missouri Compromise line (36°30' parallel north) west to the Pacific (south of Carmel-by-the-Sea, California), allowing the possibility of slavery in most of present day New Mexico and Arizona, and Southern California. The line was again proposed by the Nashville Convention of June 1850. General organized territory, avoiding the question of slavery in the territories. Senator John Bell (with the assent of Texas) in February 1850: New Mexico would get all Texas land north of the 34th parallel north (including today's Texas Panhandle), and the area to the south (including the southeastern part of today's New Mexico) would be divided at the Colorado River of Texas into two Southern states, balancing the admission of California and New Mexico as free states. First draft of the compromise of 1850: Texas's northwestern boundary would be a straight diagonal line from the Rio Grande 20 miles north of El Paso to the Red River (Mississippi watershed) at the 100th meridian west (the southwestern corner of today's Oklahoma). the Fugitive Slave Act was strengthened. Congress convened on December 3, 1849. On January 29, 1850, Whig Senator Henry Clay gave a speech which called for compromise on the issues dividing the Union. However, Clay's specific proposals for achieving a compromise, including his idea for Texas' boundary, were not adopted in a single bill. Upon Clay's urging, Senator Stephen A. Douglas, Democrat of Illinois, divided Clay's bill into several smaller bills, and passed each separately. When he instructed Douglas, Clay was nearly dead and unable to guide the congressional debate any further. The Compromise came to coalesce around a plan dividing Texas at its present-day boundaries, creating territorial governments with "popular sovereignty" (without the Wilmot Proviso) for New Mexico and Utah, admitting California as a free state, abolishing the slave trade in the District of Columbia, and enacting a new fugitive slave law. Most Northern Whigs, led by William Henry Seward who delivered his famous "Higher Law" speech during the controversy, opposed the Compromise as well because it would not have applied the Wilmot Proviso to the western territories and because of the new fugitive slave law, which would have pressed ordinary citizens into duty on slave-hunting patrols. This provision was inserted by Democratic Virginia Senator James M. Mason to entice border-state Whigs, who faced the greatest danger of losing slaves as fugitives but who were lukewarm on general sectional issues related to the South into supporting Texas's land claims. Zachary Taylor avoided the issue as the Whig candidate during the 1848 U.S. presidential election but then as President attempted to sidestep the entire controversy by pushing to admit California and New Mexico as free states immediately, avoiding the entire territorial process and thus the Wilmot Proviso question. Taylor's stand was unpopular among Southerners and surprised them because Taylor was a Southerner. On April 17, a "Committee of Thirteen" agreed on the border of Texas as part of Clay's plan. The dimensions were later changed. That same day, during debates on the measures in the Senate, Vice President Millard Fillmore and Senator Benton verbally sparred, with Fillmore charging that the Missourian was "out of order." During the heated debates, Compromise floor leader Henry S. Foote of Mississippi drew a pistol on Senator Benton. In early June, nine slave holding Southern states sent delegates to the Nashville Convention to determine their course of action should the compromise take hold. While some delegates preached secession, eventually the moderates ruled, and they proposed a series of compromises, including extending the geographic dividing line designated by the Missouri Compromise of 1820 to the Pacific Coast. The various bills were initially combined into one "omnibus" bill. Despite Clay's efforts, it failed in a crucial vote on July 31, opposed by southern Democrats and by northern, anti-slavery Whigs. He announced on the Senate floor the next day that he intended to persevere and pass each individual part of the bill. The 73-year-old Clay, however, was physically exhausted as the effects of the tuberculosis that would eventually kill him began to take its toll. Clay left the Senate to recuperate in Newport, Rhode Island, while Stephen A. Douglas wrote the separate bills and guided them through the Senate. The situation had been changed by the sudden death of President Taylor and the accession of Millard Fillmore on July 9, 1850. Fillmore, anxious to find a quick solution to the conflict in Texas over the border with New Mexico, which threatened to become armed conflict between Texas militia and Federal soldiers, reversed the administration's position late in July and threw its support to the compromise measures. The Northern Democrats held together and supported each of the bills and gained Whigs or Southern Democrats to pass each one. All passed and were signed by President Fillmore between September 9 and September 20, 1850. The popular sovereignty. It passed the House 97–85. The popular sovereignty. It passed the House 108–97. It passed the Senate 30–20. Texas gave up much of the western land which it claimed and received compensation of $10,000,000 to pay off its national debt. Clay was still given much of the credit for the Compromise's success. It quieted the controversy between Northerners and Southerners over the expansion of slavery and delayed secession and civil war for another decade. Senator Henry S. Foote of Mississippi, who had suggested the creation of the Committee of Thirteen, later said, "Had there been one such man in the Congress of the United States as Henry Clay in 1860–'61 there would, I feel sure, have been no civil war." The Compromise in general proved widely popular politically, as both parties committed themselves in their platforms to the finality of the Compromise on sectional issues. The strongest opposition in the South occurred in the states of South Carolina, Georgia, Alabama, and Mississippi, but unionists soon prevailed, spearheaded by Georgians Kansas-Nebraska Act of 1854 introduced by Stephen Douglas, which had the effect of repealing the Missouri Compromise and led directly to the formation of the Republican Party, whose capture of the national government in 1860 led directly to the secession crisis of 1860-61. Many historians argue that the Compromise played a major role in postponing the American Civil War for a decade, during which time the Northwest was growing more wealthy and more populous, and was being brought into closer relations with the Northeast. During that decade, the Whig Party had completely broken down, being replaced with the new Republican Party dominant in the North and the Democrats in the South. But others argue that the Compromise only made more obvious pre-existing sectional divisions and laid the groundwork for future conflict. In this view, the Fugitive Slave Law helped polarize North and South, as shown in the enormous reaction to Harriet Beecher Stowe's novel Uncle Tom's Cabin. The passage of the Fugitive Slave Law aroused feelings of bitterness in the North. Furthermore, the Compromise of 1850 led to a breakdown in the spirit of compromise in the United States in the antebellum period, directly before the Civil War. The Compromise exemplifies this spirit, but the deaths of influential senators who worked on the compromise, primarily Henry Clay and Daniel Webster, contributed to this feeling of increasing disparity between the North and South. The delay of hostilities for ten years allowed the free economy of the northern states to continue to industrialize. The southern states, to a large degree based on slave labor and cash crop production, lacked the ability to industrialize heavily. By 1860, the northern states had added many more miles of railroad, steel production, modern factories, and population to the advantages it possessed in 1850. The North was better able to supply, equip, and man its armed forces, an advantage that would prove decisive in the later stages of the war. Three major types of issues were addressed by the Compromise of 1850, to wit: a variety of boundary issues; status of territory issues; and the issue of slavery. While capable of analytical distinction, the boundary and territory issues were actually included in the overarching issue of slavery. Pro- and anti-slavery interests were each concerned with both the amount of land on which slavery was permitted and with the number of States which respectively would be in the slave or free camps. Since Texas was a slave state, not only the residents of that state, but the pro- and anti-slavery camps on a national scale had an interest in the size of the state of Texas. 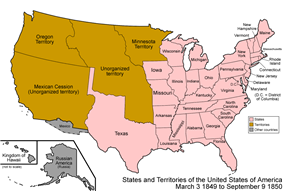 The general solution that was adopted by the Compromise of 1850 was to transfer a considerable part of the territory claimed by the state of Texas to the federal government, to formally organize two new territories, the Territory of New Mexico and the Territory of Utah, which expressly would be allowed to locally determine whether they would become slave or free territories, to add another free state to the Union (California), adopt a severe measure to recover slaves who had escaped to a free state or free territory (the Fugitive Slave Law), and to abolish the slave trade in the District of Columbia. The independent Republic of Texas won the decisive Battle of San Jacinto (April 21, 1836) against Mexico and captured Mexican president Antonio Lopez de Santa Anna. He signed the Treaties of Velasco, which recognized the Rio Grande as the boundary of the Republic of Texas. The treaties were repudiated by the government of Mexico which insisted it was sovereign over Texas and promised to reclaim the lost territories. To the extent that there was a de facto recognition, Mexico treated the Nueces River as its northern boundary control. A huge, largely unsettled area lay between the two rivers. Neither Mexico nor the Republic of Texas had the military strength to effectively assert its territorial claim. On December 29, 1845, the Republic of Texas was annexed to the United States and became the 28th state. Texas was staunchly committed to slavery, with its constitution making illegal the unauthorized emancipation of slaves by their owners. With this annexation the United States inherited the territorial claims of the former Republic of Texas against Mexico. The territorial claim to the area between the Nueces River and the Rio Grande and Mexican resistance to it led to the Mexican-American War. On February 2, 1848, that war was concluded by the Treaty of Guadalupe Hidalgo. Among the provisos of the Treaty was the recognition by Mexico of the area between the Nueces River and the Rio Grande being a part of the United States. The Republic of Texas had claimed ownership of the eastern half of present-day New Mexico, along with sections of Colorado, Kansas and Wyoming, but Texas had never effectively controlled the area, which was dominated by hostile Indian tribes (see Comancheria). However, the federal government now controlled the area after 1846. The Compromise of 1850 solved the problem by setting the present boundaries of Texas in return for $10 million in federal bonds paid to the state of Texas. The Constitution (Article IV, Section 3) does not permit Congress to unilaterally reduce the territory of any state, so the first part of the Compromise of 1850 had to take the form of an offer to the Texas State Legislature, rather than a unilateral enactment. The Texas State Legislature did ratify the bargain and in due course the transfer of a large swath of land from the state of Texas to the federal government was accomplished. Texas was allowed to keep the following portions of the erstwhile disputed land: that which is south of the 32nd parallel, and that which is south of the 36°30' parallel north and east of the 103rd meridian west. The rest of the land which had been disputed between Mexico and the Republic of Texas was transferred to federal government. The first law of the Compromise of 1850 also organized the Territory of Utah. Some of the land had been claimed by the Republic of Texas. The Treaty of Guadalupe Hidalgo made no mention of the claims of the Republic of Texas; Mexico simply agreed to a Mexico-U.S. border south of both the "Mexican Cession" and the Republic of Texas claims. Before the Compromise of 1850, this disputed land had been claimed but never controlled by the state of Texas. Of importance in 1850 was land included in present-day eastern New Mexico. From the Mexican Cession, the New Mexico Territory received most of the present-day state of Arizona, most of the western part of the present-day state of New Mexico, and the southern tip of present-day Nevada (south of the 37th parallel). From Texas, the territory received most of present-day eastern New Mexico, a portion of present-day Colorado (east of the crest of the Rocky Mountains, west of the 103rd meridian, and south of the 38th parallel), and a small portion of present-day Wyoming. From the Mexican Cession, the Utah Territory received present-day Utah, most of present-day Nevada (everything north of the 37th parallel), a major part of present-day Colorado (everything west of the crest of the Rocky Mountains), and a small part of present-day Wyoming. This included the newly founded colony at Salt Lake of Brigham Young. From Texas, the Utah Territory received most of present day eastern New Mexico, and some of present-day Colorado that is east of the crest of the Rocky Mountains. 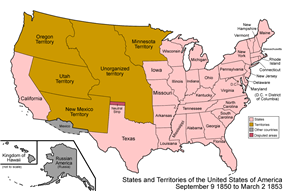 A key provision of each of the laws respectively organizing the Territory of New Mexico and the Territory of Utah was that slavery would be either permitted or prohibited as a local option (Popular Sovereignty). This was an important repudiation of the idea behind the Wilmot Proviso (which never passed Congress); it would have forbidden slavery in any territory acquired from Mexico. California also became part of the U.S. as a result of the Mexican Cession. After the Mexican War, California was essentially run by military governors. President James K. Polk tried to get Congress to officially establish a territorial government in California, but the increasing North vs. South debates prevented this. The South wanted to extend slave territory to Southern California and to the Pacific coast, while the North did not. Starting in late 1848, Americans and foreigners of many different countries rushed into California for the California Gold Rush, exponentially increasing the population. 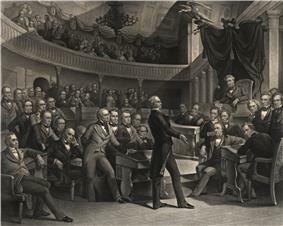 In response to growing demand for a better more representative government, a Constitutional Convention was held in 1849. The delegates there unanimously outlawed slavery. They had no interest in extending the Missouri Compromise Line through California and splitting the state; the lightly populated southern half never had slavery and was heavily Hispanic. The fourth statute of the Compromise of 1850, enacted September 18, 1850, is informally known as the Fugitive Slave Law or the Fugitive Slave Act of 1850. (It bolstered the Fugitive Slave Act of 1793.) The new version of the Fugitive Slave Law required federal judicial officials in all states and federal territories, including in those states and territories in which slavery was prohibited, to actively assist with the return of escaped slaves to their masters in the states and territories permitting slavery. Any federal marshal or other official who did not arrest an alleged runaway slave was liable to a fine of $1,000. Law-enforcement officials everywhere in the United States had a duty to arrest anyone suspected of being a fugitive slave on no more evidence than a claimant's sworn testimony of ownership. The suspected slave could not ask for a jury trial or testify on his or her own behalf. In addition, any person aiding a runaway slave by providing food or shelter was to be subject to six months' imprisonment and a $1,000 fine. Officers capturing a fugitive slave were entitled to a fee for their work. In addition to federal officials, the ordinary citizens of free states could be summoned to join a posse and be required to assist in the capture and/or custody and/or transportation of the alleged escaped slave. This particular law was so rigorously pro-slavery as to prohibit the admission of the testimony of a person accused of being an escaped slave into evidence at the judicial hearing to determine the status of the accused escaped slave. Thus, if a freedman were claimed to be an escaped slave under the Fugitive Slave Law he or she could not resist his or her return to slavery by truthfully telling his or her own actual history. The Fugitive Slave Act was essential to meet Southern demands. In terms of public opinion in the North the critical provision was that ordinary citizens were required to aid slave catchers. Many northerners deeply resented this requirement that they personally aid and abet slavery. Resentment towards this act continued to heighten tensions between the North and South, as inflamed by abolitionists such as Harriet Beecher Stowe. Her book Uncle Tom's Cabin stressed the horrors of recapturing escaped slaves, and outraged Southerners. The fifth law, enacted on September 20, 1850, prohibited the slave trade (but not slavery itself) in the District of Columbia. Southerners in Congress were unanimous in opposing this provision, which was seen as a concession to the abolitionists, but were outvoted. ^ Mark J. Stegmaier (1996). Texas, New Mexico, and the compromise of 1850: boundary dispute & sectional conflict. Kent State University Press. ^ W. J. Spillman (January 1904). "ADJUSTMENT OF THE TEXAS BOUNDARY IN 1850.". Quarterly of the Texas State Historical Association 7. ^ Texas State Historical Association. "COMPROMISE OF 1850". The Handbook of Texas. ^ Michael Holt, The Rise and Fall of the American Whig Party (1999), p. 529-530: "only rapid passage of the omnibus bill appeared to offer a timely escape from the crisis." ^ Elizabeth Fox-Genovese,Fruits of Merchant Capital (1983). ^ "Handbook of Texas Online: Compromise of 1850". Foster, Herbert D. (1922). "Webster's Seventh of March Speech and the Secession Movement, 1850". William Aloysius Keleher (1951). Turmoil in New Mexico. Santa Fe: Rydal Press. Knupfer, Peter B. "Compromise and Statesmanship: Henry Clay’s Union." in Knupfer, The Union As It Is: Constitutional Unionism and Sectional Compromise, 1787-1861 (1991), pp. 119–57. Sewell, Richard H. Ballots for Freedom: Antislavery Politics in the United States 1837-1860 New York: Oxford University Press, 1976. Stegmaier, Mark J. (1996). Texas, New Mexico, and the compromise of 1850: boundary dispute & sectional crisis. Kent State University Press.